Sitting on the mountainside, the palm forests looked down over the farm-tilled sugar cane fields, and beyond over the blue and turquoise ocean. The towns were littered and far away, made of sand-bleached houses with toys sitting in the yard. We tiptoed over the broken coral rocks to the beach, and stayed there under the passing thunder clouds, the ocean turning a deep blue, and melting into the evening. We walked through the town looking for dinner, checking out the front of every restaurant in the town before finally choosing the one across the street from our hotel. Once back at the hotel, we washed our clothes in the hotel washing machine, channel surfed through the same 5 channels without success, and fell asleep. Two weeks later, I still have sand in my shoes. ‘Weak Ends’ was recorded and mixed before and after a trip to Okinawa in July, 2013. It included a PDF of seven selected photographs. ‘Weak Ends’ was available in a limited edition CDR package on the August 2013 Japan tour of Celer with Christoph Heemann and Jim O’Rourke. Will Long came out with over a dozen new releases this year under his Celer project, in keeping with his consistently stupefying output. Celer has, for a while now, been my favorite modern ambient. I mentioned in my review of Eluvium’s Nightmare Ending that Eluvium evokes a feeling in me very specific to the ambience of the Pacific Northwest. Celer and Chubby Wolf, on the other hand (especially on great releases like Menggayakan, The Low, the Sows, and Discourses of the Withered) often evoke a sense of wonder at the world, the traveler’s sense of awe and gratitude. It is fitting, since after all both Danielle Baquet-Long (who unfortunately passed away a few years ago, if you don’t know the story) and Will Long were something of a pair of nomadic artist-academicians, to my understanding. 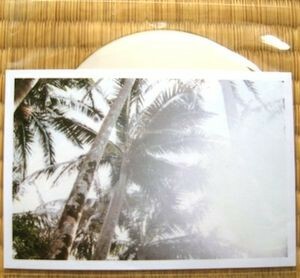 According to Long’s bandcamp, Weak Ends was influenced by a trip to Okinawa last summer. The work is a single lulling loop that repeats for about 30 minutes (not too long, not too short) with little variation. Warm sheets of synthesizers bring a tranquil scene of an afternoon on a Japanese beach to life. It is a fine ambient release that has earned a respectable place in the Celer discography and is no doubt one of the best Celer releases this year. Put it on when you’re doing dishes, trying to fall asleep, meditating, whatever you like– this is great ambient.